from debut literary novelist Drew Krepp. Henry O’Reilly, the founder and head of an enormous seafood empire nearing the end of his career, makes sudden preparations to divide his company among his three sons and entrust to them not only the family business, but the future of their North Carolina town. The youngest of the three, Patrick, remains at odds with his family’s decadence and avarice, and declines to become involved. As the two older men conspire to force Henry into early retirement and take over the company completely, his brothers’ lust for power leads to turbulent and terrifying battles with Patrick unwillingly thrust to the very eye of the storm. As greed, cowardice, and petty spite threaten to destroy those around him, Patrick proves himself no match for the scheming of others. If he is to survive the maelstrom wrought by his bickering, dangerous kin, he must find his strength within. 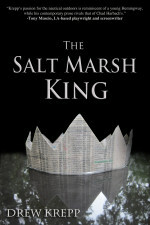 Fast on the heels of his 2013 successful short The Brackish, Drew Krepp’s debut novel The Salt Marsh King heralds the full arrival of a talented author with a voice well suited to reprise Shakespeare’s tragedy. Pingback: The Masters Review | Look at Them!